Use this purpose built tool for up to 25% larger blooms with any of your potted plants. The Plantwell Root Waterer allows for more efficient growth by allowing you to feed the plants roots directly. Simply bury the tool in the soil to create a route straight from your watering can to where the plant needs it most. Compatible with any container, designed by gardeners for gardeners. This item comes in a pack of two. Add a Plantwell to your container as it is planted up. Unlike other watering devices on the market the PlantWell delivers water to where it is most needed, the roots. The PlantWell is a UK designed and manufactured water irrigation tool. 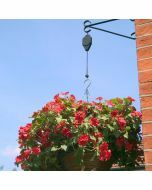 It was invented to save water in hanging baskets and pot plants. This simple device assists in giving greater blooms and saves wet feet when watering.